A holiday in Russia will take you on an enticing journey of grandeur and eclectic contrasts steeped in rich history and old-world charm. The two ‘must see’ cities of this expansive and magnificent country are Moscow, the thriving blockbuster capital, and Saint Petersburg, the showpiece city of culture and beauty. Both cities offer visitors a feast of Renaissance Russian architecture guaranteed to evoke a sense of awe and splendour. 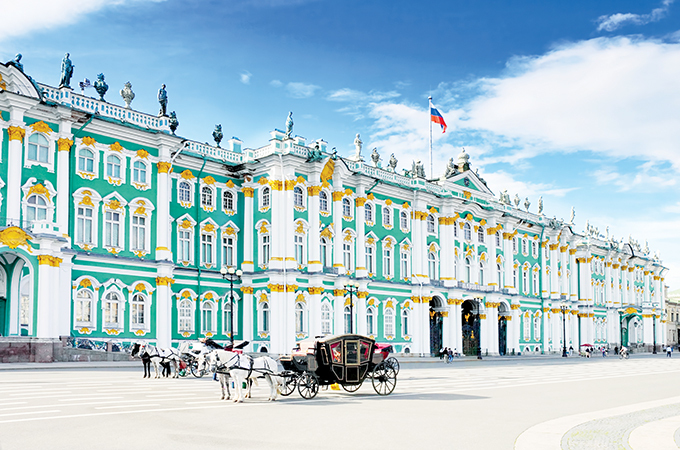 Beyond the sights and sounds of thriving Moscow and glorious Saint Petersburg, Russia’s lesser-known cities and towns, nestled in the most heavenly of landscape, are perfect getaways for travellers looking for a blend of historical culture and tranquillity. Discover Russia – its distinctive allure and myriad of sights and sounds are guaranteed to keep you coming back for more! • The Kremlin, an astoundingly fortified 14th century palace located in the heart of Moscow, which is the official residence of the President of Russia. • Lake Baikal in the Russian region of Siberia, the greatest freshwater lake in the world. To experience all that Russia has to offer, travellers from the United Arab Emirates can now apply for their visas at the professional and modern Russia Visa Application Centre, managed by VFS Global, in Dubai. The centre provides travellers an elevated level of customer experience, making travel preparations to Russia as easy and delightful as possible. Travellers heading to Moscow from the GCC can choose between several airline carriers based on your location, Fly Dubai, Gulf Air, Emirates Airlines, Etihad Airways, and Qatar Airways all have a minimum of one daily flight. Economy class rates with returns start from $650, while Business Class and First Class rates with returns start from $3811 and $7601 respectively. Within Russia, several domestic flight options and high speed trains are available to travellers, including one of the most famous train journeys in the world, the Trans-Siberian Railways. Located near the Red Square, the Ritz Carlton Moscow has an unbeatable location with luxury guest rooms and suites that are amongst the largest in the city. A favourite amongst discerning travellers, the property that was built in 2006 is known to provide travellers with the best address in town. Renowned for its historic significance, celebrity guests and regular appearances in Russian literature and cinema, Hotel Metropol Moscow was built before the Russian Revolution in 1917 in Art Nouveau style with some of Russia's greatest architects and artists as contributors. This oldest hotel in Moscow has managed to retain all the glamour and style of that extraordinary era. Situated on the famous Nevsky Prospect, the Corinthia Hotel St. Petersburg is central to every region of St. Petersburg. All of the major historical sites including the Hermitage and the Winter Palace, the Alexander Nevsky Monastery, St.Isaac's Cathedral, and the Admiralty are nearby and easily accessible from the hotel, as are the major business districts. The five-star Corinthia Hotel St Petersburg is the result of the renovation of the historic 19th century buildings in the heart of St. Petersburg on the city's main boulevard, Nevsky Prospect. Hotel Astoria, along with its neighbouring sister hotel, Angleterre Hotel, are owned and managed by Rocco Forte Hotels and is a member of The Leading Hotels of the World. Both iconic and historic hotels are on Saint Isaac's Square in St. Petersburg and reflect the luxury and opulence of the city.